The incident occurred just before 8pm yesterday evening. 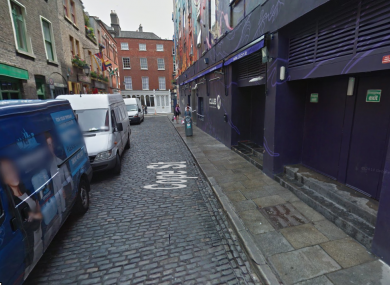 A MAN IS in critical condition in hospital this morning after being stabbed in Dublin’s Temple Bar yesterday evening. The incident occurred just before 8pm yesterday on Cope Street. The injured man, who is in his early 30s, was taken by ambulance to St James’s Hospital. His condition this morning is described as critical. No arrests have been made and investigations are ongoing. Email “Man in critical condition after being stabbed in Temple Bar”. Feedback on “Man in critical condition after being stabbed in Temple Bar”.